We’ve already introduced you to the great benefits that retargeting can bring your business: more traffic, more sales, and lower costs. Whatever your advertising goals, these retargeting platforms have options to help you achieve your goals. Here are our picks for the top retargeting platforms on the market! 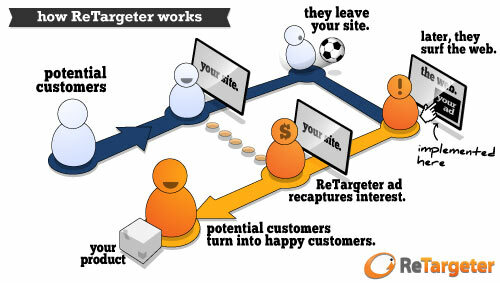 ReTargeter is great for recapturing leads that have gone cold and customers who have made purchases in the past. Their CRM retargeting tools make tracking old users by email easy and effective. ReTargeter has also been building a rep because of their great customer service – even clients at the lowest spend level have a dedicated account manager to help them make the most of their experience. The base price is very affordable at $500, but pricing scales aggressively based on monthly visits. A site that receives 50k visits a month should expect to pay around $2,500/month. Chango focuses on search retargeting rather than site retargeting, which is a good option if you need to increase site traffic. Instead of targeting people who visit your site, they track people who have searched keywords that are relevant to your brand. Because they are full-service, they don’t have a platform for you to log into and check your results. Since you have to place a lot of trust in Chango to use their services, they might not be a great option if you’re just getting started and want to ease into retargeting. Contact for a quote specific to your needs, but their minimum I/O is 10k. French giant Criteo is the only provider on our list to offer a pure CPC pricing model, so you only pay when your ads result in site traffic. Their dynamic banners are unique because they’re optimized twice: first at the “look and feel” level, and a second time to customize recommended content for viewers. Criteo provides great results if your goal is to draw visitors deeper into your site; they claim that nearly 78% of Criteo-driven sales are for products users have never seen before on the brand’s website. Contact Criteo for a quote, but their CPC model gives advertisers some flexibility as to how much their campaign will cost in the long run. AdRoll has done a great job of integrating contextual and behavioral targeting into their platform. You can choose to target viewers only when they’re on relevant sites. For instance, if you sell cookware, targeted viewers will see your ads on cooking blogs, but not when they’re reading tech sites. They put a premium on transparency, which is great since their basic model is a DIY one. At the entry level you don’t get an account manager and you have to do everything yourself. If you’re just starting out and want to some help, be prepared to pay. AdRoll doesn’t have a minimum spend for their starter package, so if you’re looking for a budget-friendly option to get you started with retargeting, AdRoll is your best bet. For around $10k you can get their Plus program, which gives you the perk of having a dedicated account manager. For about $20K you qualify for Pro, which gets you premium support with design and campaign execution. Fetchback offers site and search targeting plans, so you can recapture visitors who have left your site and drive traffic from potential customers as they search for products. They focus on integrating analytics into their services, giving you access to dynamic, comprehensive reports to help users make informed decisions about their ad campaigns. Fetchback provides a helpful in-site demo for those who want to see exactly how retargeting works before they make the leap. Price is flexible depending on the size and activity of your site, but Fetchback offers free consultation on request. They are primarily an enterprise-focused solution, so plans for budget-conscious businesses aren’t available yet. TapAd is unique because they focus on cross-platform advertising. They provide the same real-time advertising that other retargeting platforms provide, but they also allow you to reach audiences on mobile devices. Considering how prevalent tablet and smartphone browsing has become, TapAd provides a vital in-road to reaching an audience that might otherwise go untouched. Since cookie-targeting isn’t feasible for mobile advertising, Tapad utilizes other sources like data from publishing partners and Wi-Fi connections to target users. It’s not an exact science (yet), but TapAd is one to watch as the advertising industry continues to evolve. They’re still growing, but if you’re interesting in learning more about their services, contact TapAd. Looking for more information on top marketing platforms or other retargeting tools? Download one of our free marketing software comparison reports to browse leading solutions, or visit the marketing resource center for all of our materials on marketing software.